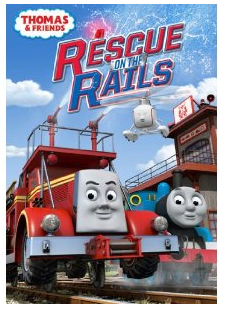 Thomas & Friends: Rescue on the Rails is another fun show that my kids love! Especially my 2 year old son ever since he got a little Thomas the Train. :) He runs it around the track while he watches the shows. He even sleeps with the little Thomas! This a new Thomas & Friends DVD from HIT Entertainment and Lionsgate. If your kids are Thomas fans then they'll love this one. And as a parent you'll enjoy the absence of annoying voices or repetitive jarring noises. :) I also enjoy shows about teamwork for my kids. I would love for them to see themselves as part of a team. Ready to Rescue! The Sodor Search and Rescue Team is racing to the rescue — Bertie’s stuck on Shake Shake Bridge, Gordon’s derailed and Thomas’ firebox is on fire! In these exciting episodes, your favorite engines brave the rails to rescue their friends. Discover that being heroic is more than having speed and strength; it’s about teamwork and a big heart – which puts every Really Useful Engine on the right track. Giveaway will end Tuesday January 10th at Midnight MST. Winner will be chosen by Random.org. I was given the above dvd to review from Lionsgate and HIT Entertainment. No other compensation was received. All opinions are my own. If you have previously won the above DVD you are not eligible. All information gathered for the giveaway will be discarded when over. Your privacy is important.